New kinds of electronic gadgetry for communicating between offices are buzzing on to the market every day. In theory, the so-called office of the future could enable any present-day paper-shuffler to work at home while communicating with his fellow workers electronically. But, according to a report about to be published by Pactel, anything remotely like that will emerge more slowly in Europe than in the United States. And the integrated office will be slow to arrive even in America. The individual components are here (see chart). So are three big problems. One is to link the components together, so that computers can talk directly to facsimiles and facsimiles can talk to each other. A second is the business of sorting out realistic applications from the silly ones. Salesmen demonstrate how to put your engagements on a computer as if diaries had never been invented or as if it took no time and money to program a computer. 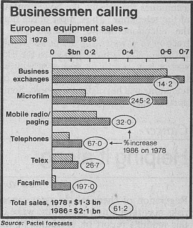 Judging by the Pactel report, many companies would be wise to consider buying a microfilm system rather than a computer; or facsimile machines rather than word-processors (if their main need is electronic mail rather than text editing). A third problem is simply lack of information. Because marketing is done by competing suppliers of individual bits of equipment, companies are often at a loss to choose the best mix. One apparent weakness of microfilmed records is the fact that they cannot be transmitted down a telephone line. Yet the problem could be solved simply by transmitting a facsimile copy and then microfilming the facsimile at the other end. Someone should get into the business of marketing such packages. • Facsimile. The main purpose of facsimile is the sending of printed messages over the telephone line. The development of reliable machines that can transmit a page in under a minute has now greatly boosted the potential market. The price is high at present (typically $10,000 a machine) but falling rapidly; by the mid-1980s it should be comparable to the cost of today’s slower machines, taking two to three minutes to transmit a page. In the United States ITT is setting up a facsimile network with gadgetry to switch messages between incompatible machines in different companies. In Europe greater compatibility among machines would help to spur inter-company use. So would a directory of companies’ facsimile numbers. This kind of electronic mail can already be cheaper than posting a letter. • Private electronic exchanges. IBM shook its European competitors in the early 1970s with the success of its electronic telephone exchange, and they have since been racing to catch up. The constraints on the market have been two. One is price; the other is that rules on design differ from country to country, requiring equipment to be redesigned for each market. European post offices need to learn that there is profit in compatibility. A portable telephone that you could stuff in a pocket and take to the golf course? A mixed blessing. But it is not far off. Bell—and some of its independent rivals in the United States—have licked the problem of congestion on the scarce radio frequencies that the portable equipment would have to use. Motorola thinks it can produce the small, low-powered equip-ment. The federal authorities have allowed the trials, so the telephones could be in American pockets by 1980. The first step has already been taken. Bell in Chicago and American Radio Telephone Service in Washington, DC, have installed local, computer-controlled receiving stations in a network of cells across each city. The receiver in each cell is designed to pick up radio signals from mobile telephones and to plug them into the public (wire) network. As a caller moves from one cell to another, a computer automatically switches him on to the next receiver. Today’s high-powered mobile telephone equipment wastes radio channel space by blaring out radio “noise” over wide areas; by permitting callers to use low-powered equipment, designed only for transmitting over short distances, the cell system will allow more customers to be squeezed into the available channels. That is worth money. There are already 40,000 users of mobile telephones in the United States; there are another 20,000 on the waiting list, and the market will grow as micro-electronics brings the cost down. Chicago’s new service will be able to handle 2,000 customers, each paying $70-85 a month plus call charges—rather less than most mobile services cost today. Since July, Bell employees have been acting as guinea-pigs for the system, and tests have gone well; it will be offered to the public on December 20th. Bell reckons that 25 cities could have the service in five years—including New York (which at present can handle only 700 customers). At first, the Chicago telephones will only be mobile, not portable; they will be engineered into vehicles. But those in Washington, supplied by Motorola, will be portable. The cell system allows the size of the battery needed to power a mobile telephone to be reduced drastically, and micro-electronics is bringing down the size of the telephone itself. In addition, Motorola has developed techniques for varying the power output of the telephone. Thus, most of the time the telephone would consume only a fraction of a watt. But the power would automatically be turned up when the user was in, say, a difficult corner of a building. The idea of being tyrannised by telephone will horrify some people. Some doctors may welcome it. This entry was posted in Analog, Telephone. Bookmark the permalink.